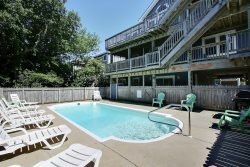 Situated next to a wooded lot, Beach Bliss is a four bedroom beach retreat in an ideal location for the perfect Outer Banks vacation. Located in the heart of the Outer Banks in Kill Devil Hills, this home is within walking distance or a short drive to local beach shops, a variety of restaurants with local flavor, and great attractions for the entire family...some of our favorites are the Wright Brothers museum and memorial, Jockey's Ridge state park, and of course the gorgeous beaches. Best of all, Beach Bliss is a short stroll away from the shore, as beach access is only 530 feet from your back door. Beach Bliss has a spacious floor plan that connects the kitchen, dining, and living areas. There is ample room to stretch-out and relax while visiting with friends and family, and the fully equipped kitchen makes meal times a joy. Relax on the front or back porch for a break from the sand, or retreat to one of four bright bedrooms to find your own private haven. Whether you’re enjoying ample family time or drifting off to sweet dreams, Beach Bliss is outfitted with everything you’ll need to unwind in style. Outside, enjoy a dip in the 12'x25' private pool (new for 2019!) to cool off from the hot summer sun. While the kids splash and play, clean your awesome catch-of-the-day and grill it up for dinner on the outdoor grill! With a fantastic locale that’s close to everything the central Outer Banks has to offer and an inviting roster of amenities to delight family members of all ages, Beach Bliss is pure vacation paradise. Book your escape today, and discover just how blissful life at the beach can be.